XD card file recovery software to recovers lost, deleted, corrupted and formatted files from XD Card . Aidfile data recovery software can help you recover data from XD card easily. Use "Undelete" mode to recover deleted files from XD Card. Use "Unformat" mode to recover lost files after format XD Card. Use "Recover partition" mode to recover files if XD Card partitions changed or damaged or deleted. Use "Full Scan" mode to recover files which can not be found with "undelete" and "unformat" and "recover partition",recover video if XD card show as raw partition,recover the files of XD card partitons which are not NTFS,nor exfat,nor fat32. With deep and full scan lost data from partition , hard drive, usb. completely recover all data from hard drive. If you have deleted pictures or other files on your camera's xd card, or formatted the card by mistake, even the xd card was damaged, error, or cannot read for some reasons. Aidfile Recovery software will help you restore the lost data files. Why xd card file is missing we need recover lost xd card files ? XD card data files lost include: deletion, formatted, Wrong partition, format error, accidentally deleted, MBR missing, logical partition error, the logical bad sectors hard disk, hard disk 0 track damage, hard logic of the lock, the partition table is lost all lost data (provided there is no physical problem, do not delete the photos after photos of too many) data recovery rate is high. The following reasons also can cause xd card file loss : do not plug a result of normal (prompt to format the file is missing) problems, accidentally deleted, wrong format, virus attack, it is physically bad sectors so data recovery rate depends on whether the U disk identification, if the XD card is not recognized, data recovery very difficult, otherwise data recovery success rate is high. How to recover lost,deleted or formatted xd card files ? When a file had been deleted from your memory card, its contents aren't immediately destroyed. If you use an undelete process before Windows uses that part of thememory card to write a new file,you can recover your deleted files. Download Aidfile Recovery and install it to your computer following the instruction. Launch aidfile recovery software from Start menu. 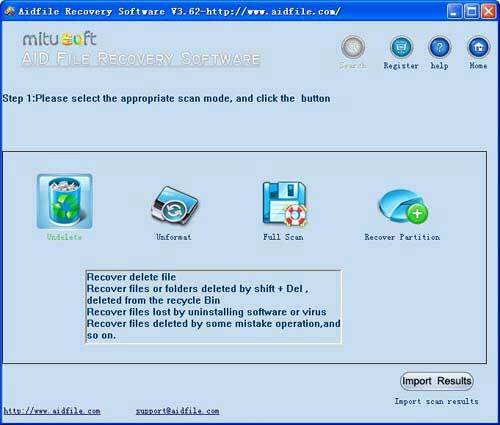 following aidfile recover software so it is very easy to use.After you click Next, Aidfile will begin to Full and automatic scan on the XD memory card. How to recover file from XD card?